Anthony Yarde earned a fifth-round stoppage win over Travis Reeves as boxing returned to the Royal Albert Hall for the second time in 20 years. Yarde has now won 18 fights with 17 of those wins coming via KO or stoppage. 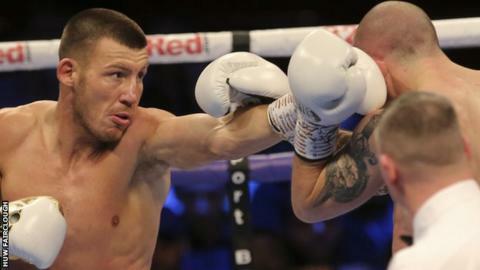 In front of close to a sell-out crowd, two Welsh fighters, Liam Williams and Chris Jenkins, enjoyed eye-catching wins in British title fights. Williams knocked out Joe Mullender while Jenkins upset champion Johnny Garton to win the welterweight title. In the main event Yarde continued to show his promise with a dominant display against American Reeves. Reeves had only previously been stopped twice before, but had no answer to an onslaught in the fifth round that saw Yarde move closer to a world title chance. Yarde showed patience as he cautiously tested his opponent with fast and effective body shots before a series of heavy right hands saw Reeves unable to defend himself on the ropes. The victory earned Yarde the WBO inter-continental light heavyweight title as he targets a world title chance. On the undercard, Williams knocked out challenger Mullender with a thunderous right hand in the second round to successfully defend his British lightweight title. Williams produced a flurry of punches to floor Mullender, who answered the count but looked unsteady on his feet, with Williams saying after the fight he felt the referee should have stopped it earlier. It was another impressive victory for Williams who has looked very sharp in his two victories since joining Dominic Ingle's stable. His compatriot, Chris Jenkins, caused a big upset with a points victory over Johnny Garton to win the British welterweight title. The Gary Lockett-trained fighter was the busier boxer and dominated an entertaining contest thanks to a controlled performance that belied the fact he was rated by bookmakers as a 5-1 underdog. The 30-year old from Swansea produced the most polished performance of his career, winning on the scorecards by a wide margin. Better known these days as a venue to host word class classical and opera concerts or the latest ballet, the Royal Albert Hall is steeped in boxing history, having staged its first fight in 1918. Only one professional boxing show has been witnessed at the Royal Albert Hall in the past 20 years, headlined by Billy Joe Saunders in 2012. The likes of Howard Winstone, Sir Henry Cooper, Naseem Hamed, Lennox Lewis, Ricky Hatton Jimmy Wilde and Joe Calzaghe have fought there, while Muhammad Ali also appeared in exhibition bouts in 1971 and 1979. At a venue where former world heavyweight champion Frank Bruno fought 15 times, heavyweight prospect Daniel Dubois dominated Razvan Cojanu, winning by knockout within two rounds to win the vacant WBO European title in the other main undercard bout. The show was set to be headlined by two-time Olympic gold medallist Nicola Adams challenging for the WBO world flyweight title, but she withdrew due to injury.